I am going to take some photos in a book shop and we will take some photos of books. I won't take a close-up of the book cover. But the book cover will still appear completely in the photo. Does this infringe copyright? A lot depends on what your purpose is in doing this. If you want generic images of books or bookshops, like your second example, then the exception for incidental inclusion should cover you and you won't need permission. If you intend to refer to the specific book, like example one, then that might be OK if you are also reviewing or providing a critique* of the book, but it is less clear-cut if it is just being used as an illustration of books in general. The same applies to example three if you were referencing the work of a particular author. That's the theoretical position. However I think it would be highly unlikely that a book publisher would object to a cover of one of their books being used in this way, and a court might well treat a claim of infringement as de minimis unless there were other factors involved which made the infringement more egregious. So at a practical level, if say you were discussing Mao Zedong, using the first image as an illustration while not actually referring to the specific book in the accompanying text, would probably be acceptable to the publishers even though the law doesn't provide an exception for this purpose. 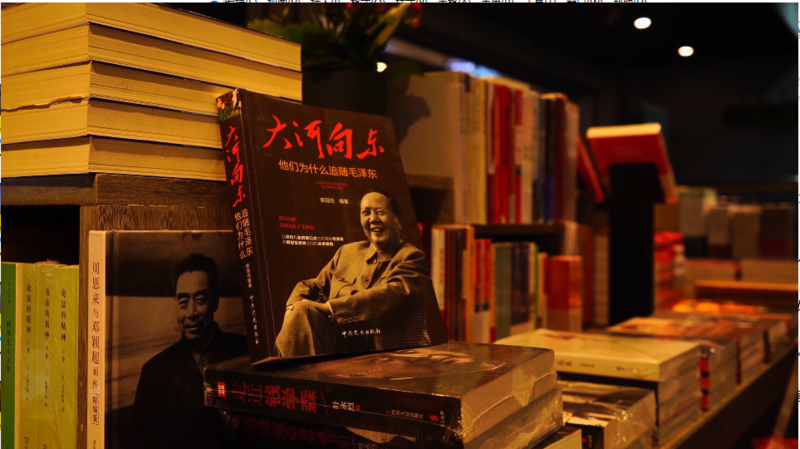 However if the book cover in example one was photographed square on, and the title and text removed so that, effectively, you obtained a copy of the portrait of Mao Zedong without it being clear it was a book cover, then that would be far more likely to be treated as infringement as it would conflict with the rights of the author of the photograph. From your question, it doesn't sound like that is what you intend to do. Perhaps one way of approaching the issue is to ask yourself what a reasonably attentive person seeing your photograph would understand by the inclusion of the book or books. If they would just think of it as an illustration of books, then incidental inclusion might well apply, but if their reaction was 'why did the photographer use that particular shot of that book?' then you are much more likely to be straying into an area where infringement could arise. This is not a legal test, but one which a copyright owner might adopt when judging whether or not to take action. I hope this helps to explain the nuances of something like this. *Technically speaking unless you provide a separate credit to the work being reviewed then the section 30 exception won't apply, but you may well still be on safer ground as discussed in the second paragraph.